When our digital marketing partnership with Rockaway, Inc. began in early 2017, the website traffic was stagnant. The website had no clear navigation structure, pages were too long with extra sections that weren’t related to the page name, and the eCommerce capability was less than sufficient. Our campaign began with immediate work on the navigation and content, SEO updates, and Local SEO including business listing optimization. Due to URL and SEO limitations of the Weebly platform, we decided to work on transitioning the website to the WordPress platform hosted on our own dedicated server. 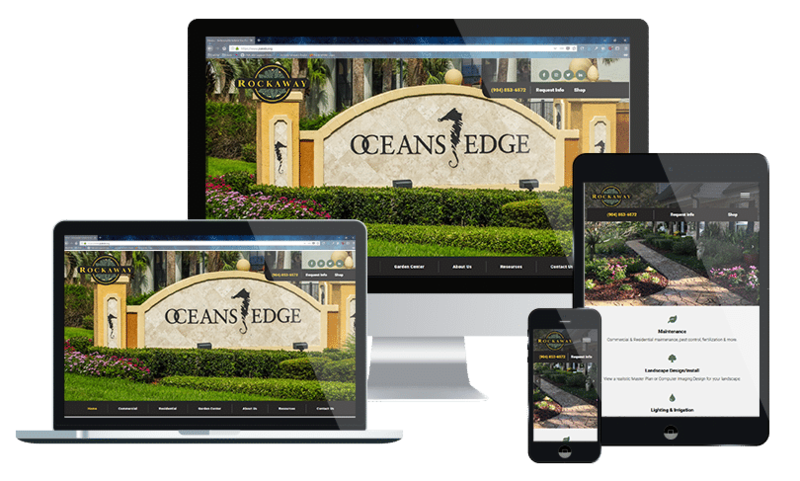 This work was done at no additional charge to Rockaway to ensure their company would receive the full growth potential of our SEO and Content Marketing services. If you would like help moving your website away from Weebly or another platform, please provide your information and a member of our team will contact you within one business day. The ownership team at Rockaway, Inc. had been considering a rebrand and domain name change, and we agreed that the time to make such a drastic move was during this website transition. Rockaway, Inc. was one of the leading commercial and residential landscaping companies in North Florida, yet every reference to the company was “Rockaway Garden Center” and the domain was rgcjax.com. The rebrand would transition the company name to “Rockaway, Inc.” with the domain rockawayinc.com. Changing your company name, domain name, and URL structure requires a skilled SEO company to ensure your website doesn’t completely disappear from Google and other search engines. If the proper precautions are not taken, Google will view your new website as a completely new business entity without any history or positive reputation. If you are considering a domain change or rebrand, please send us a message and we’ll talk to you about important steps that should be taken before and after the transition.